Elderberries are made into all types of foods, including jams, jellies and juices. They make tasty, warming winter cordials, teas, syrups, jams and wines. Elderberries contain bioflavonoids and vitamin C.
Great source of fiber and antioxidants. Commonly used as a daily immune booster. Can be a helpful relief for symptoms of colds and flu. Has been known to assist with allergies. Cover one teaspoon of elderberries with one cup of water in a pan. Slowly bring to a boil, then simmer for 5 to 10 minutes. 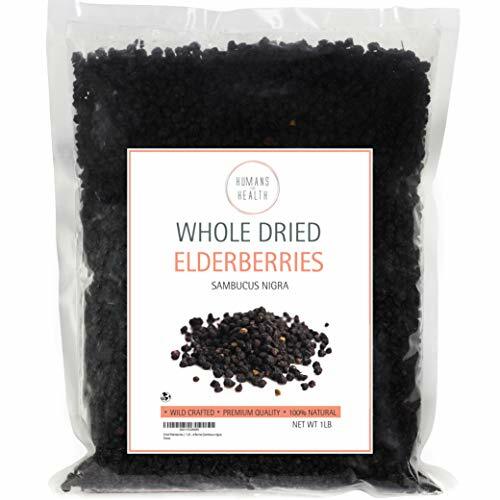 Humans for Health Dried Elderberries have a fruity aroma and a sweet-tart, fruity flavor. These berries are grown in Europe. They are dark purple and have a much-wrinkled appearance. We know you’ll love your Humans For Health Elderberries but if for some reason you aren’t 100% satisfied, return our product with a full, money-back guarantee.